The first thing one notices upon entering Asiatique is the long, curvaceous glass bar, impressively stocked with a variety of spirits and liqueurs. A long line of champagne flutes stood waiting to be filled with sparkling wine for the attendees to the Fall Bubbles Brunch – the fourth one the restaurant has hosted in the past year and a half. My wife and I were a little early for our reservation, so after being seated we decided to start with a mimosa for her and a Bloody Mary for myself. The mimosa is a fairly simple cocktail – sparkling wine and orange juice – and thus difficult to mess up, but this specimen was outstanding. The distinction was clear: fresh squeezed orange juice. The contrast between carton orange juice and fresh-squeezed is easy to see; the former is a little thicker, while the latter is paler in color, sweeter, and just tastes more fresh. It makes a world of difference. My Bloody Mary was also greatly satisfying. In the world of mixed drinks, there is one single exception to the no-pre-made-mixes rule: Zing Zang Bloody Mary Mix. The only thing better is if you juice fresh tomatoes yourself. My drink came deliciously spicy, garnished with a feta-stuffed olive, a wedge of lime, and celery. Our first sparkling wine was served shortly after: La Marca Prosecco. Prosecco is an Italian sparkling wine, whose grapes come from the region of the same name. The wine hit the palate with a bright, crisp flavor; although on the dryer side, some exploration revealed a slightly sweet, citrusy side. The Prosecco came paired with roasted butternut squash and yellow curry soup, in which sat three small chunks of roasted duck breast. The soup was warm and sweet, but with a bit of a spicy bite provided by the curry. The duck practically melted in the mouth, as well-prepared duck should. The key to unlocking the full potential of food and wine pairings is to take a bite of the food, followed immediately by a sip of wine without first cleansing the palate. This changes the character of the wine, and if it is a good pairing it should enhance the flavors and notes. The next step is to take another bite of food, as the lingering wine on the palate will in turn affect the food. 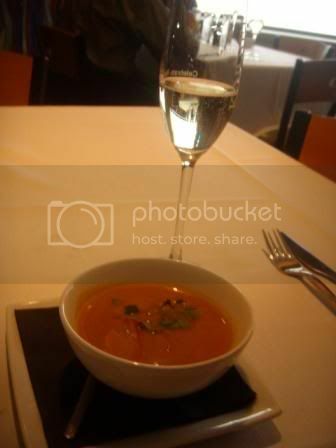 In this particular instance, the sweetness of the soup helped to pleasantly emphasize the bubblyness of the Prosecco, while the spice brought out the citrus flavors. In turn, the wine called attention to the roasty flavor of the duck.